I am trying to generate a path from a list of directions (as seen on the numpad). The coordinates are generated correctly, but because I use multiple call to \path the arrowheads are drawn on each segment. How do I change this code to only draw the starting arrowhead on the first segment and the ending arrowhead on the last segment? I have unsuccessfully tried to have one \path outside the \foreach and only coordinates inside. edit: It should work for any arrow shape passed in the optional argument. There is no question that this need to be done in one single path but you can do this quite easily with the turtle library. Simply define a direction (and a factor) for every digit. 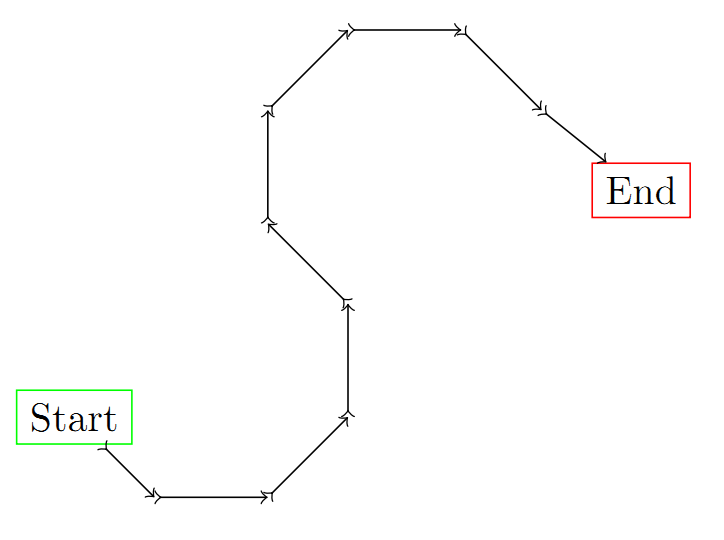 As the direction key only turns the “turtle”, also include the forward key which includes a to[/tikz/turtle/how] path to the relative coordinate in direction and the given distance, i.e. The Start and End simply insert a move to to (Start) and a (final?) line to to (End) (or whatever the how style is currently). Of course, you can use the math from your question in the setup of the digit styles, but this is just faster (for TikZ and to write up). I have created and used an auxiliary style for the setup, marked by an @. It may also preferable to simply define this style in a /aux path as we won’t use it again or really need it in the /tikz path. This also makes it easy to set all factors to 1 by omitting the value of the forward key (the default is /tikz/turtle/distance anyway if no value is given), i.e. If you suddenly feel that the keys shouldn’t be called 1, 2, … 9 but 1 step, 2 step, … 9 step you simply add step after #1. The two foreach loops are because the path starts and ends at non-zero sized nodes, but the displacements are relative to the node centres. 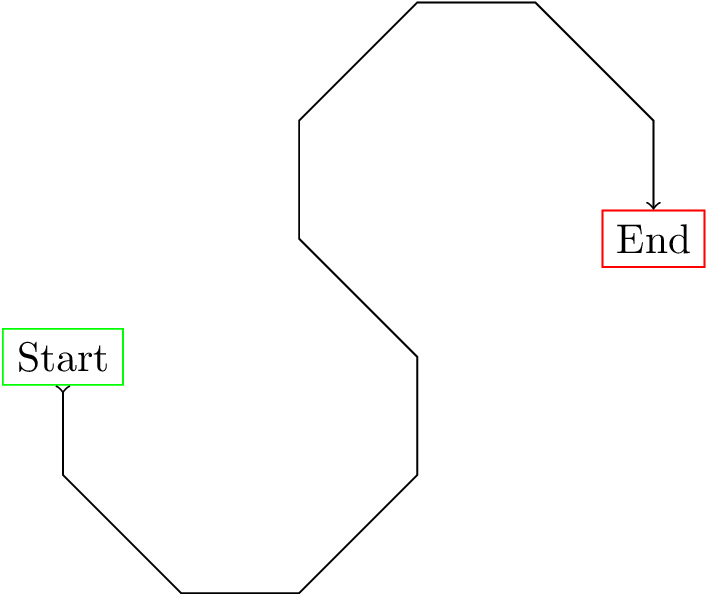 In the second path, there's an extra (c1) which is needed due to the issue raised at Draw a path between many nodes using foreach. For an alternative solution, see the answers there. Not the answer you're looking for? Browse other questions tagged tikz-pgf arrows paths foreach or ask your own question. 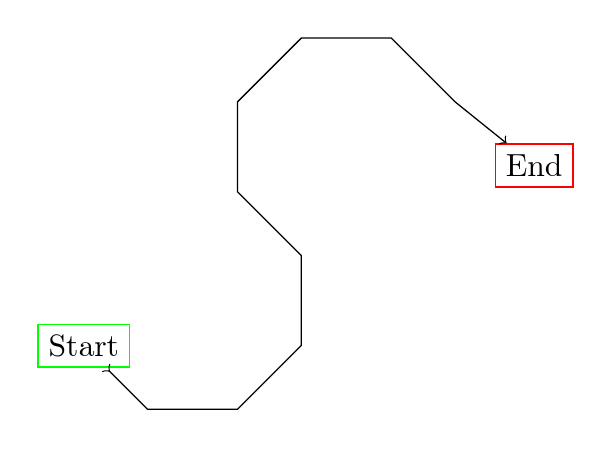 Saving and reusing/combining paths in TikZ? 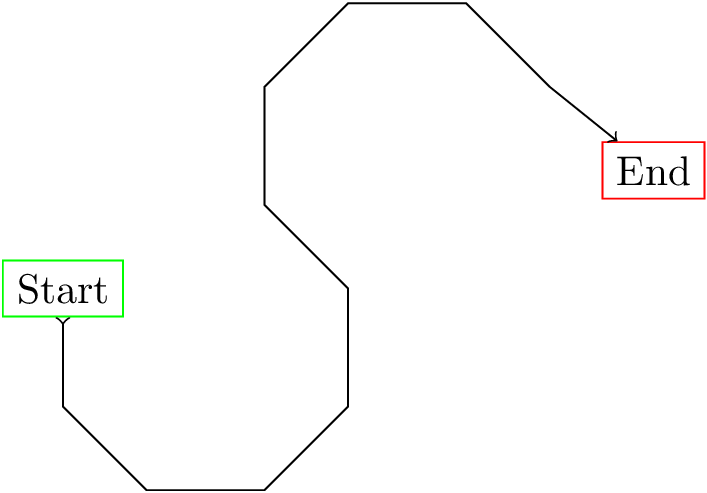 How to get a tangent coordinate system for the decoration of a path? PGF Decoration: how to remember a point between decoration states? TikZ: How to recalculate a command value variable in a foreach loop?